Frank H. Glover, my paternal great grandfather, was born in August of 1862, during the Civil War. His father, Samuel Stillman Glover (Jr.) was serving with Company H, 1st Regiment, Engineers and Mechanics, Michigan at the time of his birth. 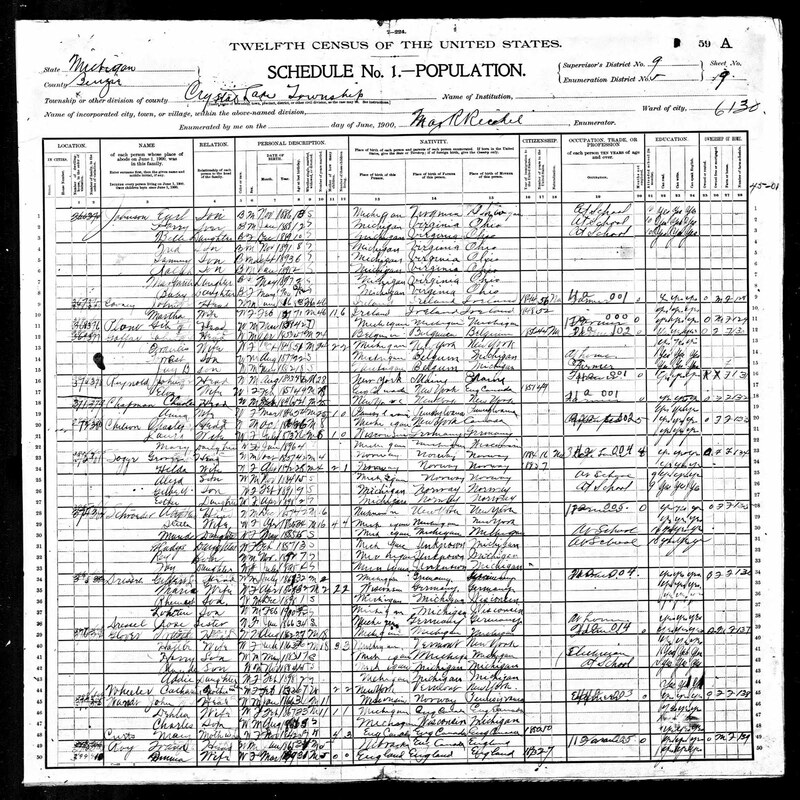 Samuel enlisted in December of 1861 and he probably didn't know he was leaving a pregnant wife when he enlisted. 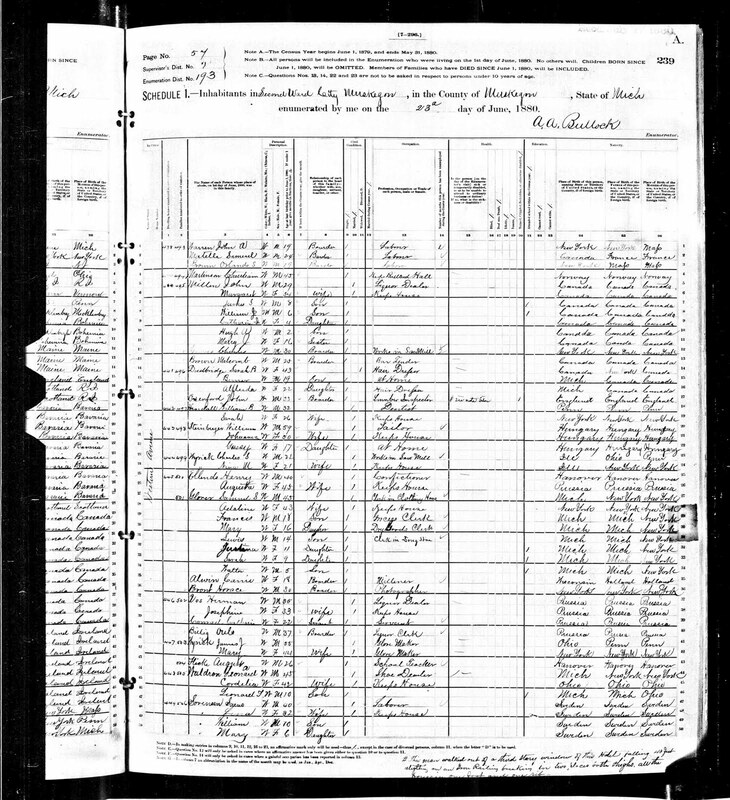 Frank H. was one of ten children born to Samuel Stillman Glover, Jr and Adaline L. Dyer. Their children were Charles W. (1859), William E. (1861), Frank H. (1862), Mary J (1864), Louis B (1866), Laura J. (1869), Sarah (1871), Emma and Emerson (1873), and Walter S. (1875). 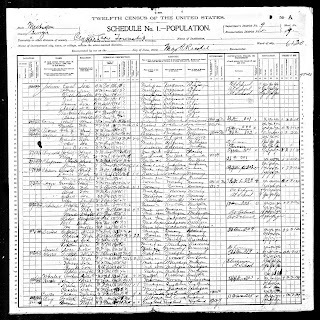 The 1880 U.S. Federal Census finds Frank and his family living on Western Avenue, Muskegon, Michigan. Frank is working as a grocer's clerk. 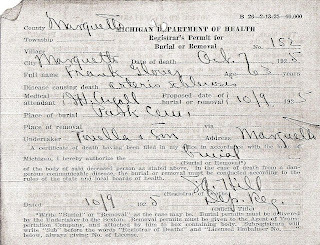 On 12 May 1882, Frank H. Glover married Hattie L. Fenn in Jackson, Michigan with Pastor JW Hough officiating. pastor of the 1st Congregational Church in Jackson. 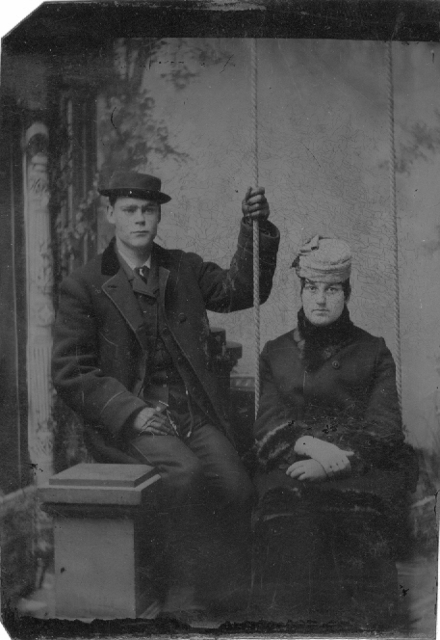 Frank and Hattie were married for 43 years. They had four children: Harry (1883-1950), Claude R (1884-1960), Adeline E. (1898-1993), and Merle M. (1902-1981). Frank H. Glover died 7 October 1925 at the age of 63. He died of a heart attack suffered on his first day of work at Powder Mill in Marquette, Michigan. 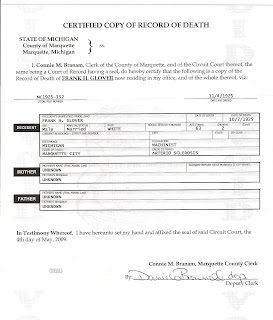 Frank H. Glover is buried in Park Cemetery, Marquette, Michigan. The year of his birth on his gravestone is 1863 instead of 1862. 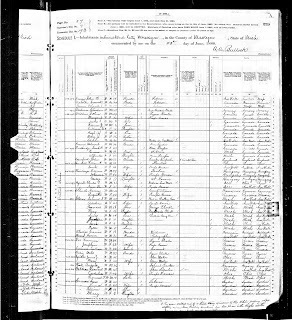 The records (marriage, census, burial permit, and death certificate) support the 1862 date. Nice! I loved seeing the picture of him. 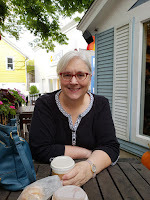 I did check my file and I have no ideas for you about Catherine Wheeler. If I turn up something you'll be the first to know! Any relation to the Massachusetts Glovers? Thanks, Apple! I hope to solve who she is eventually. 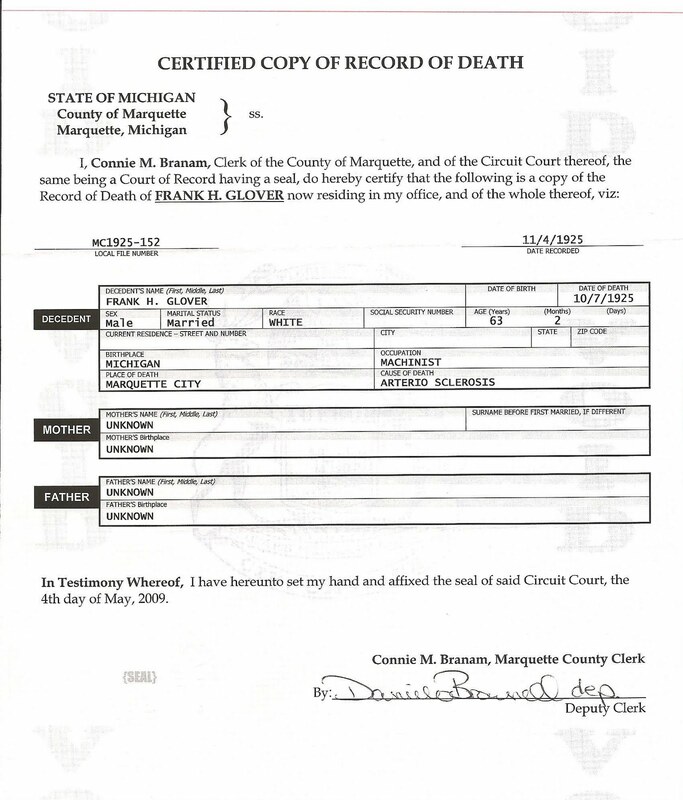 Heather, Frank H. Glover is a descendant of Samuel Stillman Glover who was born in Conway, Massachusetts. Other Glover's in my line are Samuel> Alexander>Thomas>Henry>Henry. Some of the Glover's can be found in Milton, Massachusetts and then Phelps, New York.